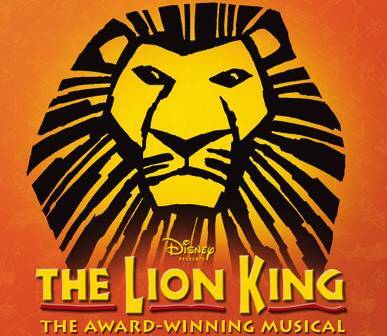 Disney's award-winning production of THE LION KING will roar into the Edinburgh Playhouse from Saturday 12th October 2013. This Edinburgh season will mark the first time the legendary musical has played in Scotland and will be the only Scottish dates in the show's record-breaking UK tour. The Lion King will play a three-month season in Edinburgh, giving audiences the opportunity to experience the global phenomenon in their local theatre. Four years in the making, this truly international production brings together a cast of over 50 actors, singers and dancers, from 17 different countries, supported by a backstage team of over 100 people. The touring production is the biggest musical production ever to tour the UK. With hundreds of masks, puppets and more than 700 elaborate costumes representing 26 different types of animal, 21 giant trucks are used to transport everything across the country. In total, the touring production will visit 10 cities across the UK & Ireland over two and a half years, with further dates and locations to be announced. Disney’s THE LION KING is based on the beloved Academy award-winning animated film which was entrusted to Director and Co-Designer Julie Taymor to adapt the film for the stage. Taymor brought a vast array of disciplines to THE LION KING which draws upon her immeasurable experience of various theatrical styles and cultures to tell the compelling tale of Simba, the young lion cub, as he journeys through life and struggles to accept the responsibilities of adulthood and his destined role of King. The acclaimed stage adaptation of Disney’s 1994 film was first seen on Broadway in 1997, where it recently became the highest grossing show in Broadway history. The production has now been seen by over 65 million people across five continents and the acclaimed West End production continues to sell out at London’s Lyceum Theatre in its 14thtriumphant year. The premiere of THE LION KING in Edinburgh will make Scotland the 18th country in which the show has been performed. In addition to the record-breaking productions in London and New York, Disney’s THE LION KING can currently be seen in Tokyo, Hamburg, Madrid and on tour in the US and Japan. In 2013, new productions will open in Sao Paulo, Brazil and Sydney, Australia. To date, this new touring production has enjoyed sell-out, record-breaking seasons in Bristol and Manchester. Both audiences and critics have embraced The Lion King, giving it rave reviews and standing ovations. After Manchester, the tour will perform in Dublin and Birmingham before arriving in Scotland.